You won't believe it's cauliflower pizza! This is one of my favorite Lean & Green meals. Preheat oven to 450 degrees. Line a baking sheet with parchment paper (waxed paper really does not work). In a small bowl, mix ingredients for crust together. Spread onto baking sheet. Pat into a 10" circle, making sure that the center is a little thinner than the edges. Bake 18-20 minutes until edges are slightly brown and middle is set. Spoon sauce over crust. 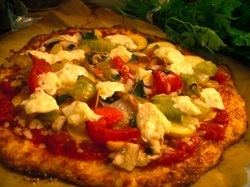 Top with cheese and veggies. Bake another 7-10 minutes until cheese is melted. Loosen pizza with a spatula, and very carefully "scoot" it onto a dinner plate. NOTE: To grate cauliflower, use a salad shooter, blender, food processor, or cheese grater until it resembles "rice".